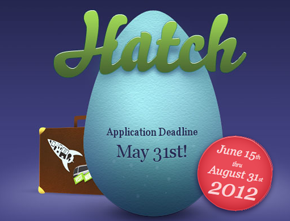 So tell us about Hatch. Hatch emerged from Start Norfolk (StartNorfolk.com). Founded in Norfolk in 2011, Hatch is committed to growing and building Norfolk’s technology and entrepreneurial community. Having held dozens of events where startups have showcased their ideas to entrepreneurs, investors such as “Startup Night” events, mentoring programs, and worked with virtually every major technology-related community organization in Norfolk, Hatch is committed, passionate member of the Norfolk tech community and has brought together mentors with decades of experience in technology, media and early-stage venture capital, who have successfully founded, built, run, sold and financed businesses. Hatch is a mentor based accelerator fostering and mentoring five startups Downtown Norfolk. Hatch gives the five startup businesses a chance to grow their business with the help of Hatch operating partners, mentors and community leaders. Hatch is supporting these companies every step of the way, aligning experts to help with each challenge these startups may face whether they be product, functional or industry-related. Hatch has assembled the most experienced group of entrepreneurial experts in Norfolk, all of whom are on deck to help solve every type of operating and strategic problem startups encounter. Tell us how your program works? Hatch Accelerator gives startup business a chance to grow their business with the help of the operating partners and mentors. All this support can’t make a company successful; that’s the startup businesses’ job. But Hatch will be with these businesses every step of the way, aligning them with a dream team of experts to help with the many challenges —product, functional or industry-related–a startup faces. Hatch has assembled the most experienced group of entrepreneurial experts in Norfolk, all of whom are on deck to help solve every type of operating and strategic problem startups encounter. Now Norfolk is an odd city made up of lots of little cities like Chesapeake, Virginia Beach, Hampton, Newport News, are you guys attracting startups throughout the region? The Hatch program attracted startups from Norfolk, Virginia Beach, Chesapeake and Suffolk, we are attracting startups throughout the region. Hatch is creating an entrepreneurial ecosystem, this region is jam packed with 1.7 million people, Norfolk is the epicenter of the entrepreneurial scene and the majority of startups are created and continue there, specifically in Downtown Norfolk. What’s the reception been like as far as other more established businesses in the community? Reception has been great; local businesses pitching in their time and services. The space is floor level with wide open windows, when looking for a spot, we chose this one because we wanted people to walk by and see work being done. There is no other spot that you walk by in downtown Norfolk that you see this. And because of this, we get a lot of walk-ins that are wondering what Hatch is all about, we tour them and explain to them it’s the future. What kind of resources does Hatch offer? • Essential business support, including legal, accounting and marketing services. • Support from mentors from successful businesses owners and capital. It was back at the first Start Norfolk, seeing how strong the ecosystem had become in such a short period of time, I knew that we had to use this momentum and start planning a longer term program. Research was started on accelerators; reached out to several across the country, saw how they were formed, who was in them and who invested in them. We had all those resources, so I knew we could do it. It was important to me to partner with the city of Norfolk, I scheduled a meeting with the City Manager after pitching the idea briefly to him at an event and he and his staff immediately understood the importance. Can you tell us about the startups in the current session? • Care Direct a web-based platform that will revolutionize how consumers find and manage health care services by allowing health care consumers or their caregivers create profiles with information necessary to confirm their eligibility for services. This information is verified by documentation that consumers upload (or snail mail) to the platform. Similarly service providers create profiles on CareDirect with descriptions of their services, real time information on service availability, and specific eligibility criteria. Unlike the many websites currently available that contain long outdated lists of unfamiliar services, consumers can trust that the information on CareDirect is always up to date. That’s because CareDirect shifts the burden of accuracy to the party with the greatest incentive to maintain it – the care providers. So when consumers search for services, only those services that are available and for which they meet eligibility criteria are returned. • Podium Pro an iPad app for public speakers, teachers, preachers and students. Podium Pro combines all the best features that speakers can only get by juggling multiple other programs, devices and aids. We will deliver a simple and affordable solution in the form of an iPad application. • TugCam: a collision avoidance platform for tugs and barges. Designed to eliminate “blind spots” on barges. Tug Cam is purpose build for the harshest environments, contains one or more wireless transmitters, rechargeable battery and night vision/ultra low-lux camera(s). Optional add-on features include sensors, alarms, additional cameras and more. The TugCam can generate an ROI within 12 to 18 months with reductions in insurance premiums while improving navigation and preventing losses to property or life. • VinylMint, allows multimedia professionals to create and share projects with each other anywhere in the world. Vinylmint’s core technology enables users to store, transfer, and manage high-gigabyte project files and any external digital assets. Vinylmint’s technology has an open application programming interface to empower users to use the content production tools their familiar with, build productive internal communities around projects and existing tools, and use a rich media library to form transactional communities between contractors and customers. • Zombie Tag: enables real-time geo-location tracking in an active mobile GPS game. Combine the growing genre of the Zombie Apocalypse and your phone to score, rank and create your own events and challenges based on the real world. From college campuses and running trails to your favorite locations around town. With realtime data shown on the dashboard as well as on all the players mobile devices. Whether on the battlefield or the playground with our geo-engine see who, what and where. Zombie Tag is the first product, with the focus on the geo-engine, this is what drives military, police, fire and rescue interest, as well as additional products. Has starting an incubator been what you thought it would be like? Better than I could imagine. Each startup is ahead of schedule, the mentors are spending more time than expected, local businesses are getting behind and everyone(The Hatch5, investors and other local entrepreneurs are gearing up for Demo Day). How many sessions are you going to do? We are still researching how many a year we think will suit us best, but 2 is the number we are looking at.